The recent discussion of Old School versus New School booksellers reminds me of the old saying: "The world is made up of two kinds of people: those who lump people into two categories, and those who don't." Sellers in the used book trade are by nature opinionated, independent thinkers - ask six booksellers a question, and you are likely to get a dozen different opinions - so trying to neatly divvy them up into two camps may be an exercise in futility. That said, there is still value in discussing two theoretical opposing themes in current bookselling, with the explicit acknowledgment that the real-world situation is far more complex. This article will examine different attitudes towards the importance of learning the language of books. This summer, my family went on a camping trip to Indian mound country in southern Ohio. We planned our trip to take us out through western Maryland, Pennsylvania and West Virginia to do some sight seeing along the old National Road. The building of the National Road and the later construction of canals and railroads caused major changes in the American social and business cultures. In much the same way, the advent of the Internet - the so-called Information Superhighway - has radically changed the economic and social landscape of the world. Any technology that directly impacts the flow of information and goods has a fundamental effect on the marketplace. In early nineteenth century America, the technology was road building, in the latter half of the nineteenth century, rail transport, and in the twentieth century, there were two major technologies: first, the internal combustion engine, which initiated another round of road building (cf. the US interstate system); and second, air transport. And finally, the late-twentieth century to today has seen the burgeoning growth of the Internet. 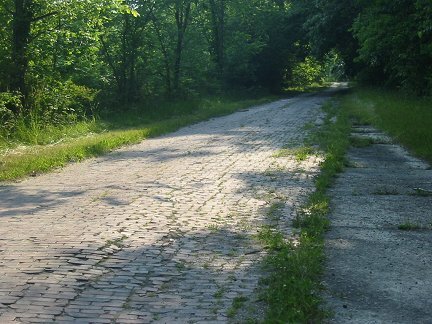 Scattered along the old National Road are the remnants and ruins of numerous towns - in particular, businesses that at one time flourished as a result of trade, the continuous movement of goods and people. Stables, inns and tollhouses are three examples. A traveler might only expect to go 15 to 30 miles in a day, so the National Road afforded much commercial opportunity along its entire length. When rail transport arrived and diverted much of the traffic away from the National Road, the economic landscape changed, and many of these businesses simply disappeared. It is a BookThink precept that concealed within the heart of change is opportunity. Prior to 1990 - admittedly a somewhat arbitrary date - bookselling had remained essentially unchanged for generations. Of course, there were important historical changing forces at work in the 20th century - two world wars; the Great Depression, etc., and there were noteworthy changes within the bookselling trade - the rise and decline of individual authors, collections and institutions; the growing significance and value of dust jackets; the hypermodern phenomena, and so on. But bookselling itself remained largely the same. Stories of the grand old booksellers teaching the trade to lowly apprentices, who then took over the businesses or went out to start their own ... these Horatio Alger tales were as common in the 1930s as they were 50 or so years later. The language of the trade was passed on from one generation of sellers to the next and indeed helped to define the trade and the professionals who practiced it. Just as two rocket scientists who've never met can have lively discussions about SRBs, discharge coefficients and ablation, so too could two booksellers happily discuss aeg, intaglio, and yapps - preferably over brandy and cigars. Which brings me to one of the most persistent complaints traditional booksellers wage against the "New School" booksellers: "Those damn newcomers barge in and don't even bother to learn the language!" The language of bookselling is in fact a precise tool that has evolved over centuries to serve specific purposes: It allows professional booksellers to communicate quickly and precisely about very specific points of a book - points which can sometimes differentiate a common reading copy from a four-figure collectible. As with any profession's jargon, acronyms abound: aeg (all edges gilt), 8vo (octavo), waf (with all faults), ffep (front free end paper), etc. Publication costs demanded that both brevity and precision be used in producing copy for print catalogs or placing ads in trade magazines. One observes the same phenomenon in real estate classifieds, where every character is counted and paid for, also in text messaging, where acronyms and other shortcuts are used to be speed communication and make efficient use of small cell phone displays. Of course, having a "secret" language makes it more difficult for non-trade members to understand, thus reinforcing an "Us and Them" mentality and contributing to the (largely undeserved) negative connotations of the word "jargon." Today, the pressing need for "want" and "for sale" ads in trade magazines no longer exists. Indeed, the quintessential trade magazine for placing such ads, AB Bookman's Weekly, went out of business in 1999 after over 50 years of publication. Some booksellers still publish paper catalogs, true, but their numbers are declining, giving way to online listings. In contrast, there is no premium for brevity when listing online - just the opposite - no longer a practical reason for a seller to use "aeg" in a book description. It may seem to be an elitist affectation that traditional sellers cringe when an eBay seller describes a book as having "shiny gold stuff on all three sides" instead of the traditional "all edges gilt," but there are several good reasons for making the effort to learn to speak professional bookseller's vernacular.